The research platform FINO 2 is located 33 kilometers north of the island Rügen in the border triangle Germany-Denmark-Sweden on the southern edge of the shelf “Kriegers Flak”. The coordinates of the platform are 55 ° 00'24,94'' N 13 ° 09'15,08'' E.
On the German side the first wind farm "Baltic 2" of EnBW is completed. On the Danish and Swedish sides more wind farms will arise in the direct neighbourhood of FINO 2. For the planning and construction of the Platform, a geotechnical expertise was required in accordance with standard ground investigation of 2003. The exploratory drilling was driven to a depth of 35m below the seabed. Geophysical surface investigations were not available for this location. The drilling took place July 2005 and was performed by Petrobaltic S.A. on the polish drilling ship “St. Barbara”. The construction of the platform was carried out according to the report of the DWD ("Conditions of Wind and Sea in the Baltic Sea Area of the prospected wind farm Kriegers Flak D”) of June 2003. According to the data from the report mentioned above, the following threshold values occur: The 10-minutes peak values were calculated using a 10% increase of the 1-hour peak values. The most important water levels are: average water level, 50-year high and low water level. For the 50-year high water level two values must be set: The annual maximum high water level with 98% quantile and the annual minimum low water level with 2% quantile. 15% of the observed high and low water levels have a deviation of ± 125 cm to average water level, 50% have only ± 20 cm. In this area storm tide warnings are announced at 150 cm above average water level. As there is no precise information for the location of Kriegers Flak, the 50-year-level was set with a deviation of ± 1 m to average water level. The design-relevant flow conditions were based on reports and manuals of the Federal Maritime and Hydrographic Agency (Bundesamt für Seeschiffahrt und Hydrografie = BSH). According to the BSH, there are no statistical analyses for the location of Kriegers Flak. The main factor to generate the ocean current is the wind, which causes the drift current. Associated with that is the impound current and the flow occurred by periodic waves of the water mass. Density-compensation-currents and tidal currents can occur super-imposed. In calm weather, there is a slope-compensation-current with outflow into the North Sea. The design of the platform is based on the report of the DWD ("Conditions of Wind and Sea in the Baltic Sea Area of the prospected wind farm Kriegers Flak D”) of June 2003. For a return period of 50 years, the maximum wave height was set with Hmax = 12.00 m and an associated period of 9.0 seconds. For a return period of 5 years, HS5 was considered with a maximum wave height of Hmax = 10.6 m and a period of 8.5 seconds. For ice conditions in the Baltic Sea, the approach for horizontal and vertical ice loads was made according to DNV-OS-J101:E 505, API RP 2N as well as the “Recommendation for Technical Approval of Offshore Wind turbines, December 2001“ of the Danish Energy Agency’s Approval for Wind Turbines. Local guide values on thickness and compressive strength correspond to the manual of BSH: Part B for the Baltic manuals, No. 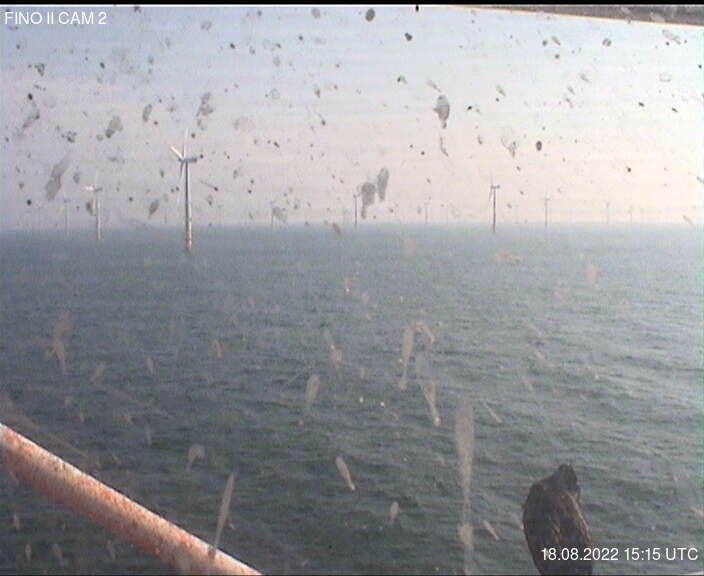 20032, natural conditions in the Baltic Sea. In accordance to DNV- OS-J101, Sec. 4, Table E7, the compressive strength for the 50-year return period in the southwestern Baltic Sea is determined to ru = s0 = 1.90 MPa. For this location, according to Sec. 4, Table E6 the reference thickness of the ice is h = 50cm. In case of icing, an ice accretion with a thickness of 10 cm should be considered, on airside structures of the mono pile, platform and the structure of the measuring mast to 20 m above sea level, circumferentially for all components. From 20 m above sea level the ice’s thickness has to be set at 3 cm circumferentially for the mast structure and all components. Offshore wind turbines should be constructed for outside temperatures of -20°C to +50°C. ΔTs is to assume as variation of the constant temperature of ± 35K relative to an average temperature of +15°C. The operation should be possible at outside temperatures of -10°C to +40°C.